5 Tips for a Green Workspace! Whether you work in a corner office, cubicle or home office, having a green mindset saves the planet, your health and lots and lots of money. It is relatively easy to create a green, healthy work environment through carefully considered choices. With modern day technology at our fingertips, creating a green and healthy office environment is an easily achievable goal that all companies big and small should set for themselves. 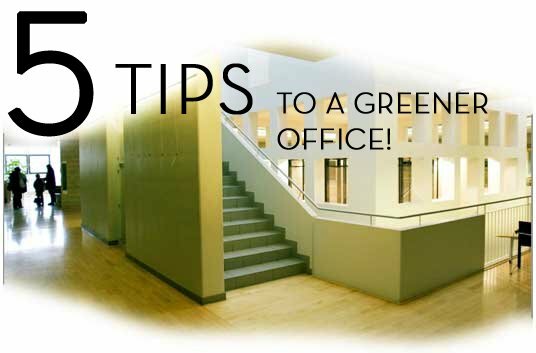 Check out these 5 tips to help you make your office environment a little greener and healthier! When perched upon our laps, we know our MacBooks can warm our nether regions, so why not use that temp to heat our leftovers?? You recycle regularly but use a lot of disposables. Two professors--one of fashion, the other of science--teamed up to fabricate melting fabric which was then used to make high-end couture-type togs. The dresses are part of a UK touring fashion exhibit entitled 'Wonderland'. The dresses, made of a polymer, are dipped into vessels of water and left to 'melt' into a gel-like substance that can be used to germinate seeds. So we all know that plastic water bottles are bad for the environment, and that’s enough to eschew their usage. However, if you ever needed more specificity to punt the plastic, Green Upgrader has ‘em. ....that plastic bottles take 700 years to even begin composting? Or that 90% of the cost of the bottle water is due to the bottle itself?? Or that 80% of all plastic bottles used aren’t recycled? Flushing your toilet with sink water isn’t new, but it’s never been this elegant, which means people might actually choose such an item for aesthetic reasons rather than ecological ones. Either way, Mother Nature will be pleased. From Caroma, which should be available in North America this year. Via. Blend age-old building techniques with a 21st century vibe and you get some extraordinary structures. Although made of earth and straw, no modern convenience seems to be missing. Find the right CFL color for you! Switching over to CFL light bulbs can be a bit startling. First there’s the cost. You just have to remind yourself that they’re going to last A LOT longer than regular incandescent bulbs and use less energy to get over that one. Next is the color. When CFLs first came out, they emitted a fairly harsh blue light. Luckily, now there are a variety of CFLs on the market including ones that produce a softer, more incandescent light. Tip Nut has an excellent list of 20 things you can use before you throw them away. Some of my favorites are refrigerating butter wrappers to use to ‘grease’ baking pans, using tissue boxes as plastic bag dispensers and turning plastic strawberry baskets into totally awesome homemade bubble machines! For the entire list–including links–visit Tip Nut. Just say NO to plastic produce bags and hello to BYO Bags! Turn Green: 15 Ways to Reduce your Eco-Footprint. 14 Creative Ways to ReUse Your Garbage. Look into your garbage can: see anything that might still have some life left to it? Here's fourteen suggestions from the Simple Dollar to use your refuse in new and creative ways. Use covers from issues of The New Yorker as gift wrapping. Add used dryer sheets to your stored clothes. Make kitchen scrubbers with rubber bands from the Sunday paper and the mesh wrapping from fruit. Use orange and lemon peels as air fresheners. Communications design agency Thomas Matthews designs sustainably, which they define via their manifesto. Here it is in ‘rule’ form. For further information regarding Thomas Matthews’ manifesto, visit their website. Image from 'Do All The Good You Can' at Allposters. 21 Environmentally Friendly Home Improvement Ideas. "Your Construction Connection" tool site Toolbarn.com has assembled a list of suggestions of (moderately) simple DIY tips to make your house a little more environmentally friendly. Some of them are pretty obvious, and a couple are repeats, but there's a few gems worth pursuing. Flush your toilet with your sink water! Top 7 Tutorials for Making Your Own Shopping Tote. Have a look at Altered Cloth's collection of patterns, instructions, and tutorials for making your own reusable bags.